"Banana Breeze" is an upscale escape by the sea, and considered by some to be a hidden gem. Tucked away in your own oasis in a private waterfront retreat, with your own heated pool. Look out at the open water views while enjoying the professionally decorated interior and spacious outdoor patio. Imagine relaxing at "Banana Breeze" with friends, family or both while listening to island music and casting away into delightful bliss. * The City of Key West requires this home lease for a minimum of 28 nights. Key Cove estates is an exclusive group of homes all located on the waterfront and provides hard to find privacy. 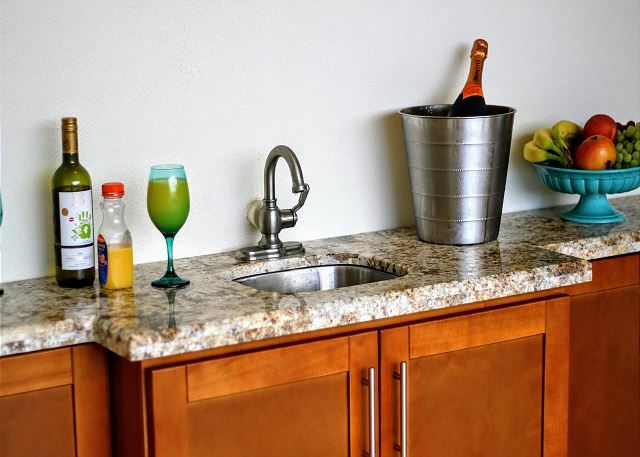 Centrally located in the middle of Key West, you and your guests will have the convenience of walking to grocery stores as well as shopping just across the street. Old Town, Key West's Historic area is just a few minutes away by transportation. Whether you bring your own vehicle or rent one of the many local options like mopeds, electric cars, or bikes, you can easily park in one of two garages or your own private driveway. The first floor of the home is located atop of a grand set of exterior stairs which lead you to the front door, through which you will find a expansive floorplan consisting of a professional kitchen fully functional for even the most advanced chefs. This area also consists of a large living room and dining area suitable for all your guests to congregate. The far wall is comprised of glass doors allowing breathtaking views at the Florida Bay and the waters edge below. This floor as a whole is your central area for entertaining guests and gathering families together. This home has two master suites located on the top floor. The first master bedroom has a King sized bed and a beautiful en-suite bathroom complete with a glass shower, large Jacuzzi tub and separate facilities room. The bedroom opens out to your waterfront balcony, with gorgeous water view. The other master suite is down the opposite hallway, with a King sized bed and an en-suite bathroom with a large Jacuzzi tub. This master suite has a large walk-in closet, and a glass sliding door with access to the same waterfront balcony. The third bedroom is beside the second master suite, with two twin beds that may be converted into 1 King upon request and has its own full bathroom. On the main floor there is a fourth bedroom with two twin beds that also seamlessly convert to a King bed, upon request and a half bathroom down the hall for convenience. On the ground floor is one of the highlights of this home: the outdoor landing and entertainment area with a heated kidney shaped pool. The outdoor dining area comfortably seats six for an outdoor meal. The pool is heavenly, with views of the open water and visiting heron on the tropical greenery that surrounds the back yard. There is also a lounge area with comfortable chaises in a piece of deck that gets equal sunshine and shade. The backyard is complete with a large propane grill for BBQs. Additional space under the house also offers another covered indoor/outdoor area for playing, additional storage, etc. Washer & Dryer, Central Heat and A/C, Ceiling Fans, Off-Street Parking in Garage & on Driveway, Flat Screen State-of-the Art Smart HD TVs in all bedrooms and main living area, Fully Equipped Chef’s Kitchen with Gourmet Appliances, Private Pool, Large BBQ Grill, Linens and Towels provided. Interim housekeeping provided upon request. Wireless high-speed Internet access and full cable is included. Pets Considered. This property will accommodate 8-10 adults. Made my vacation a breeze! This home was well maintained and very clean upon our arrival. Check in and check out was very easy. Javier was more than helpful with any questions we had before, and during our trip. Great location just minutes away from Duval and the downtown area. Great customer service and beautiful homes. Will definitely recommend to my family and friends!